Sprocket Bar and Restaurant, located inside Whole Foods Market Henderson in The District starts the year off with a new seasonal menu. Open daily from 12 p.m. – 9 p.m., the bar features a wide selection of beer, wine and a seasonal menu with something for everyone. From green chile braised short ribs (yum!) and a porchetta sandwich to cauliflower nachos and roasted beet dip, the menu includes expanded vegan and vegetarian dishes like a citrus and avocado salad, grilled vegetable tamale and a roasted mushroom flatbread featuring nut-based, Kite Hill chive artisanal spread. The bar and restaurant offers daily specials and a happy hour Monday through Friday from 4 p.m. – 6 p.m. with wine, beer and food for $7 or less. The restaurant and bar will host special events and programs, including wine and beer pairings, live music and family-friendly activities. Details on upcoming events can be found here. All menu items meet Whole Foods Market’s strict quality standards, including no artificial colors, flavors, preservatives, or sweeteners, and no partially hydrogenated fats or oils. Founded in 1980 in Austin, Texas, Whole Foods Market (wholefoodsmarket.com, NASDAQ: WFM), is the leading natural and organic food retailer. As America’s first national certified organic grocer, Whole Foods Market was named “America’s Healthiest Grocery Store” by Health magazine. 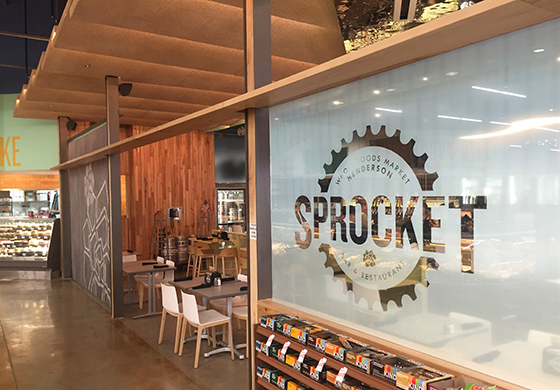 The company's motto, “Whole Foods, Whole People, Whole Planet”™ captures its mission to ensure customer satisfaction and health, Team Member excellence and happiness, enhanced shareholder value, community support and environmental improvement. Thanks to the company’s more than 88,000 team members, Whole Foods Market has been ranked as one of the “100 Best Companies to Work For” in America by FORTUNE magazine for 18 consecutive years. In fiscal year 2014, the company had sales of more than $14 billion and currently has more than 434 stores in the United States, Canada and the United Kingdom. For more company news and information, please visit media.wfm.com.